Research is part of the fabric of a Carnegie Mellon education: undergraduates are encouraged to explore new ideas, test hypotheses and share results with the community. Research is work that matters. A student research project demonstrating how bacteria found in Qatar’s sand can be used to purify water won the Best Project award at Meeting of the Minds 2016, the undergraduate research symposium at CMU-Q. The research study titled, “Characterizing a Novel Bacillus-like Phage from Qatar’s Sand,” was conducted by biological sciences student, Aya Abd Elaal, under the mentorship of Annette Vincent, assistant teaching professor of biological sciences at Carnegie Mellon in Qatar. The study explores using bacteriophages extracted from Qatar’s sand to disinfect water. A computer science project took second place in the Best Project category at Meeting of the Minds 2016. “Wireless Eruptions – Reprogramming Wireless Sensor Networks: Challenges and Approaches,” by Aliaa Essameldin, considered the three expectations of wireless sensor networks: scalability, durability and feasibility. Based on these expectations, she examined the reprogramming systems requirements of efficient communication, complete-retasking, node safety guarantees, energy efficiency and memory efficiency to evaluate the most popular existing reprogramming protocols. The sixth Undergraduate Conference in Information Systems (UCIS) focused on “Humanizing Information Technology (IT),” and submissions considered the evolving role of IT in all facets of human life. The Most Promising Research Award went to student Dana Al-Muftah for her paper titled “A Study of Web Accessibility and Related Policy Implications to Qatar.” The study evaluates the accessibility of Qatari websites for those with disabilities and suggests a policy framework to facilitate universal access. Meeting of the Minds is an annual symposium at CMU where students present their research and project work to a wide audience. A judging panel of industry experts and faculty members from other universities review the presentations, with awards given for the best projects and posters. Biological Sciences students can apply to the Summer Research Institute, a program for researching molecular biology and biochemistry at the Carnegie Mellon main campus in Pittsburgh. Research projects involve recombinant DNA techniques and biochemical methods directed toward the functional analysis of proteins and enzymes. CMU-Q biological sciences students can apply to the QBRI summer research program. This eight-week course provides students the opportunity to choose from a wide range of problems in diabetes, cancer or stem cell research. The Qatar Student Initiated Undergraduate Research Program awards funding to undergraduates at CMU-Q for summer research in any field of study. It is modeled on a similar program on the main campus. 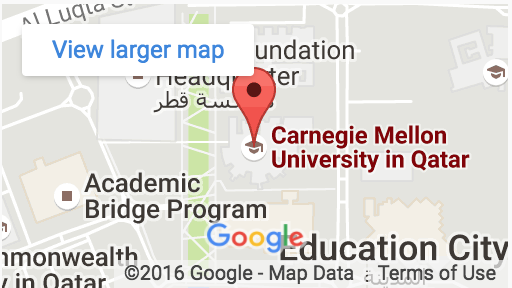 At Carnegie Mellon Qatar, first-year students can apply for Phage Genomics, a year-long course that involves purifying a virus from a soil sample, characterizing it by electron microscopy and analyzing its genetic material. This early experience in the laboratory introduces student to important concepts like designing experiments and analyzing the results, which are the foundation of their scientific studies.